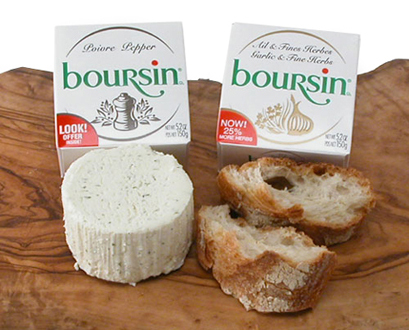 Created in 1957, Boursin cheese was cheese maker François Boursin's take on a popular French party dish, fromage frais. This recipe let guests create their own cheese and then mix it with freshly picked herbs. 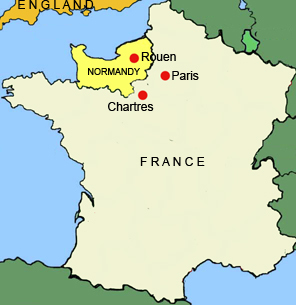 Boursin originated in the region of Normandy, but eventually became the first flavored cheese to be sold throughout France. Made from cow's milk and cream, the original Boursin cheese was also seasoned with garlic and fine herbs. The cheese's creamy texture and savory seasoning were soon its trademark. As the cheese grew in popularity, it was used to add flavor to countless recipes. Different variations of traditional Boursin were also produced. Despite this, the traditional "Garlic and Herbs" flavor is still the most popular, usually eaten with crackers, grapes, or spread on toasted baguette. J'adore Boursin! Il est très savoureux et j'aime la texture crémeux. Quand je visite mes grands-parents, je mange toujours ce fromage. Nous mangeons il avec une baguette ou raisins. Un petit peu de Boursin est délicieux. Il est très légère et mousseux aussi. On peut goût ce que l'ail et herbes sont frais.